Oh yall, we are tired around here! 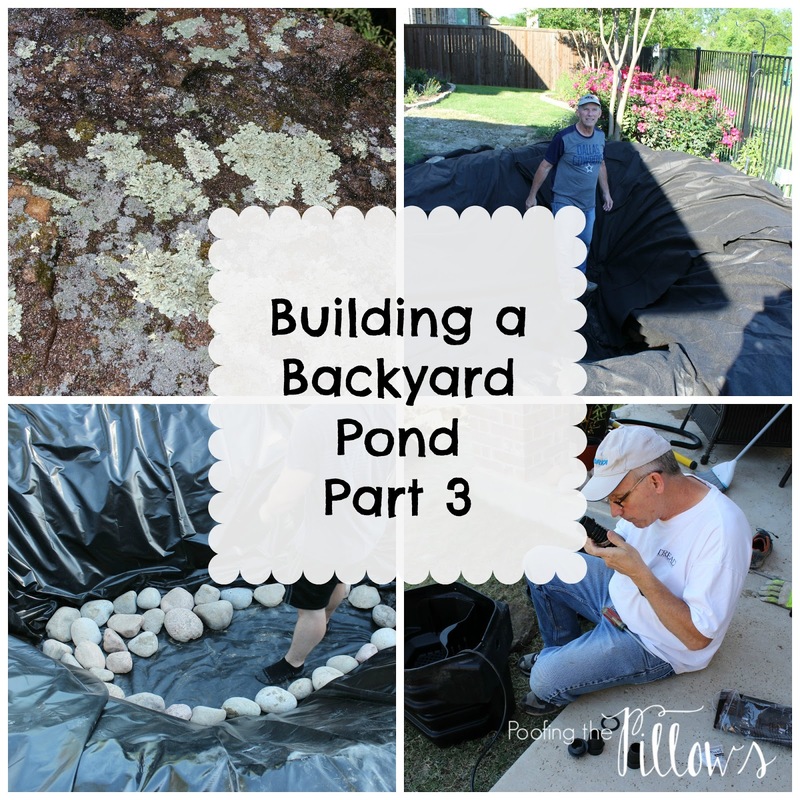 Our weekend was pretty much filled with pond building and we made major progress. Lots of pictures to show and tell today. 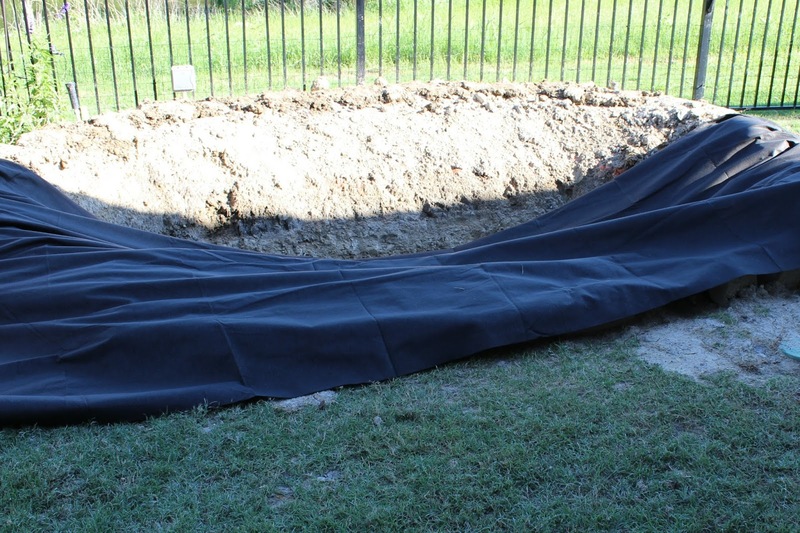 The picture below is the hole completely formed and we are beginning to put down the underlay which is a barrier between the ground and the pond skin. 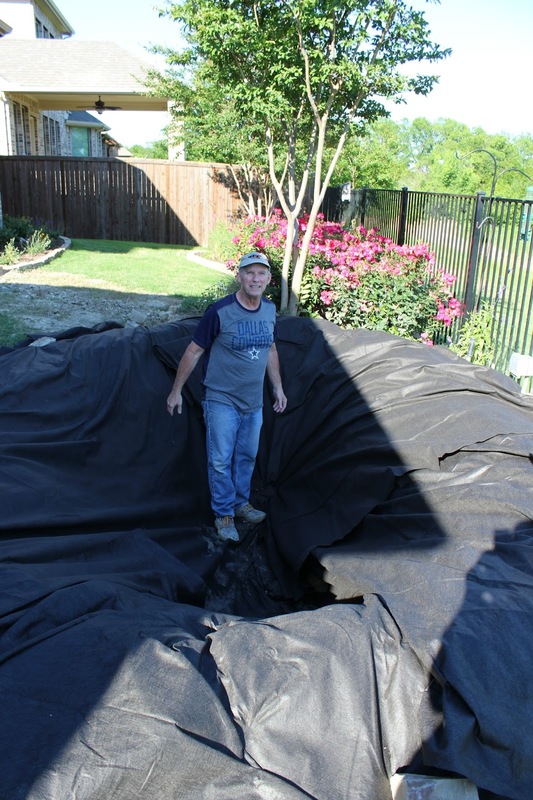 This helps protect the pond from punctures and leaks. We purchased this but you could use old carpet or something like that. Here's my man down in the big hole. I make him smile for the camera all the time and he's not too sure about it all. You can get the lay of the land in this photo and you can see how small our yard is. One of our greatest challenges with this project has been working in the small space and working around the sprinkler system. In the picture below, the pond skin or liner is in place over the underlay. The liner is a thick vinyl that comes in a large sheet. You can get this in various sizes - you just have to make sure it is large enough to cover the whole area. 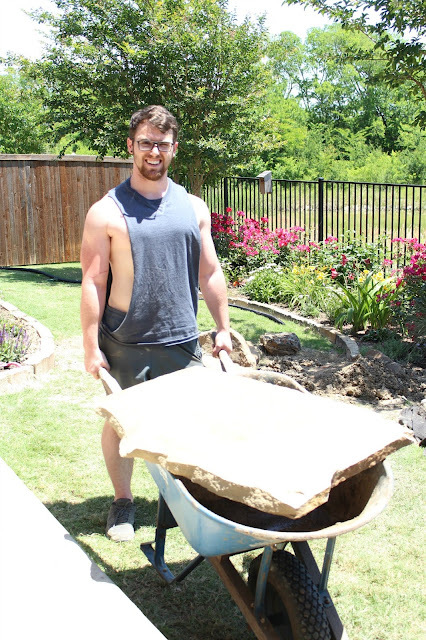 The advantage of this vs. a preformed pond is that you can do whatever size or shape you wish. Tanner is placing river rocks in the bottom of the pond because we like that look and it helps hold the liner in place. 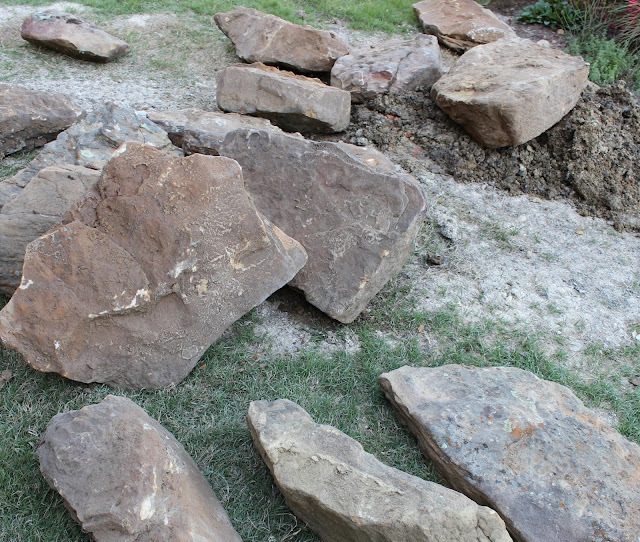 Speaking of rocks....we had a 3,000 pound pallet of mossy boulders delivered to our house last week. Tanner and Paul moved all of them to the backyard with a wheel barrow and by hand. No need for any trips to the gym this week! We love moss and lichens on the rocks! 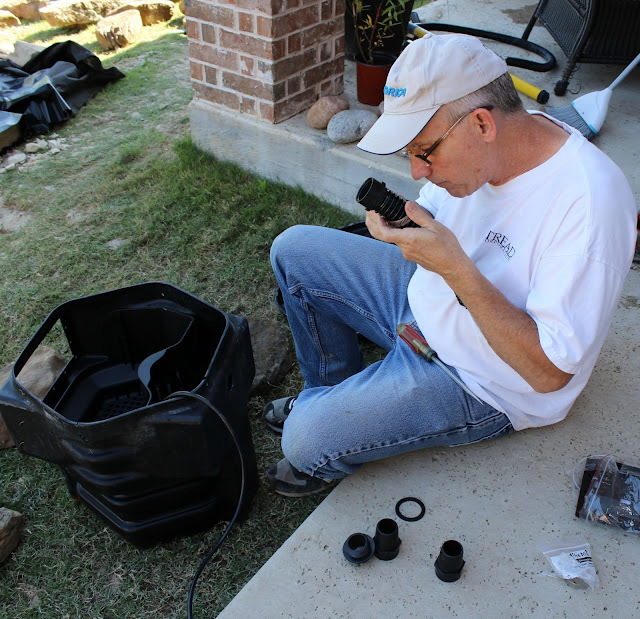 Paul's connecting hoses to the skimmer box. The pump goes inside this box and pulls the water in. The water is then sent around to the UV lights that irradiate it and help kill the algae. From there the water flows out through the waterfall. Isn't he cute? We couldn't do this job without his 24 year old muscles. The large flat rocks are being placed around the pond to help form a platform for the mossy boulders. We are working hard to make the surface around the pond beautiful but also safe and stable. Now fast forward a day or so when I didn't take pictures. I went to Stein Mart and when I came home we had this! This is definitely not finished but it's running and everything works. There is still much work to be done making this pretty and also as my husband says, "making sure it all stays together." So now let me leave you with this from a couple of weeks ago...we know we sound like hicks and I am definitely no videographer. Also, apparently I've uploaded this to YouTube and that was not on purpose!! It's going to be awesome! Your son is a cutie and yes, I bet you're glad for his muscles. Lol, moving 3000 lbs. worth of rock isn't for sissies. Those things look heavy! Look at that cutie patootie boy of yours working his muscles! 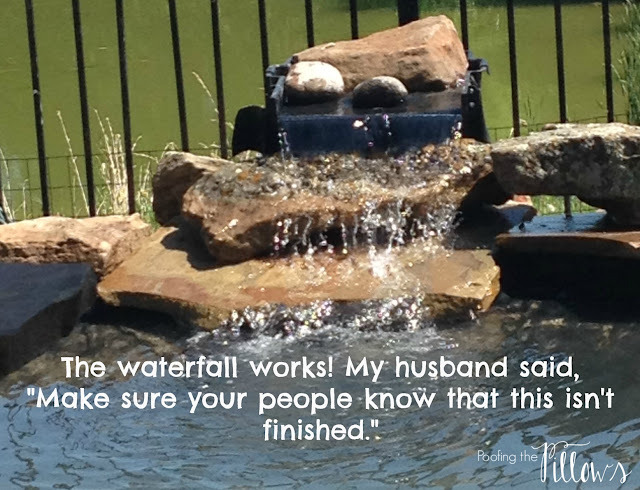 I love what your husband said and hooray that it works! That's part of the battle right there and is going to be so beautiful, I can hardly wait till the finished pictures! Hope you're having a marvelous start to your week lovely lady!! You all got a lot Fun hearing your sweet voice! Looking good! Watching the guys build ours I know how much hard work and time goes into it. And, your southern Texas accent is too cute!! This is looking amazing. I love it so far. Great job. Love the accent and looking forward to seeing it all done. Wow, lots of progress!! Love the waterfall. That pond is going to look and sound so good! A lot has been accomplished! I hope those two men didn't do their backs in with those huge rocks! You have two really good sports! How fun that it is almost finished! I know it's a lot of work but it will be something you can enjoy for years to come! What handsome workers you have too! I've enjoyed seeing the progress! Hugs! That is an ambitious project and the guys are doing a wonderful job with it. I like your idea for heading to Stein Mart. I'd be right there with you. The video is adorable and so is your sweet southern accent. What wonderful workers you have, Stacey, and I'm so impressed by all those big rocks they carried! It's going to be so pretty when it's finished. The video didn't show up on my iPad. I'll have to check,on my computer. I also loved taking a peek at Rhonda's home...so pretty! I can't wait to see the finished pond. It looks great so far! So exciting! I know you will enjoy your new pond so much! Can't wait to see it completely done. I'm sure that it will be well worth all your hard work. I dearly love your VOICE!!!! The pond is really nice!!! Love that your husband knows you "have people", as in, "make sure your people know..." I love mossy rocks with lichen, too. The pond is getting so close to being finished and looks great. 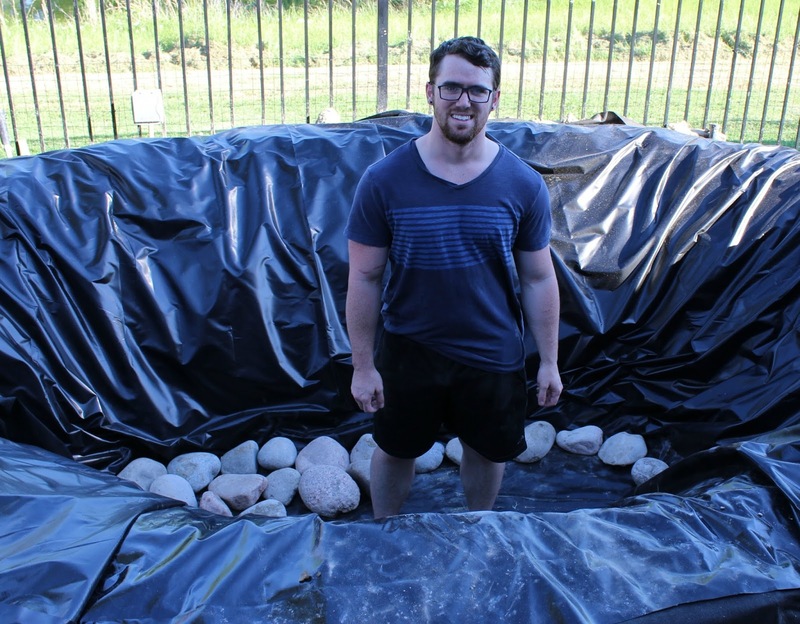 The best advice for building a pond? Have two great workers like your husband and son... Your monarch butterflies are going to love being to take drinks. Haha. I love that your husband calls us "your people." True, though. The pond is a winner! So pretty, and I imagine the sound is very soothing, too. It is coming along nicely! How neat - loving this project I bet you're excited for the finished result. So the question is what did you do with all that dirt? Looking forward to seeing more. Great progress! Unbelievable! What a fabulous crew -- FOUR STAR! And how you will enjoy it on those hot summer nigths! Wow! We could have used a hunky 24 year old last year when we were moving around all of our stones!!! You are so right about how building a pond is a workout but as you know, it's so rewarding once it's done! Can't wait to see the final reveal! This is looking so good. Your son is so cute and must be nice to help out with all the digging and lifting. It's going to be awesome and I can't wait to see it finished! What a great helper and I can't wait to see it finished! I can't wait to see the finished pond!! You've done so much so far.....and I know there's amazing things to come! Stacey, we build our own pond once and I know how much work it is. Ours was small, but had a little stream going to it. Amazing how many rocks you use!! I spy one with lichen. 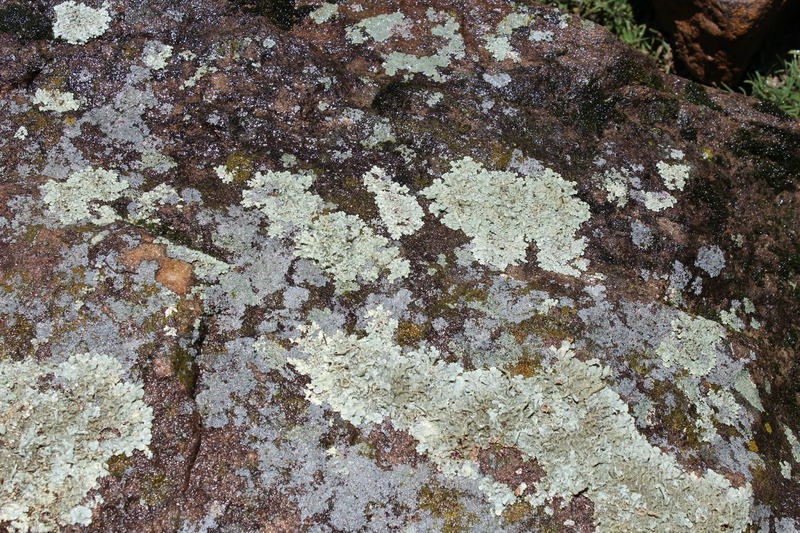 Ha, ha, just did a post about how much I love lichen and moss. It is going to be wonderful! Hubby and I just wheel barrowed pavers around back for our shed floor and we are pooped! We need a 24 year old helper. lol! Thank goodness we have a crew coming on the 21st to help frame. Thanks for sharing with SYC. It is so wonderful to have such hardworking men. This labor of love is going to be so pretty. Absolutely fabulous, and it is so deep and big! I am glad you had that strong son of yours to help out-some of this stuff looks heavy! I missed this post. The pond has really come along. You guys have done a fantastic job with it. Love the water feature even if it's not finished!